Talk about the Big 12 adding to its current list of members reached a fever pitch earlier this month. Talk about the Big 12 adding to its current list of members reached a fever pitch earlier this month. The Knights could potentially be included in a prestigious list of universities that are in the Big 12 Conference. UCF, USF, Houston, BYU and Cincinnati are names that have been mentioned as schools that could possibly join the Big 12, which currently only includes 10 universities. This upcoming season, the Knights will be playing two schools in Power Five conferences when they travel to Michigan and take on Maryland at home. UCF has had a history of trying to schedule big-name, out-of-conference opponents, but that trend might change in the coming years. 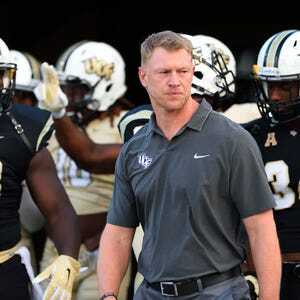 Football head coach Scott Frost avoided talking about the possibility of the Knights joining the Big 12 at the first stop of the Charge On Tour in Downtown Orlando on Tuesday, May 17. UCF is still a relatively new Division I athletics program compared to other programs in Power Five conferences. After leaving Conference USA the Knights joined the American Athletic Conference in 2013, the same year that quarterback Blake Bortles led the Knights to a 12-1 season, which culminated in a Fiesta Bowl win. The following year, quarterback Blake Bortles was selected as the third overall pick in the NFL draft by the Jacksonville Jaguars. There has recently been excitement surrounding the football program following a devastating 0-12 season in 2015. The 2016 UCF spring football game had a turnout of 23,000 people, setting a new school record and making it the 22nd-most-attended spring game in the nation. 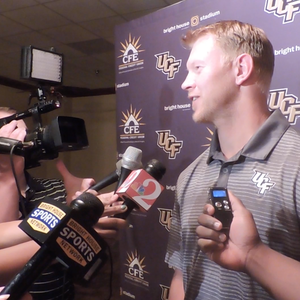 UCF Athletics is looking to start fresh and move forward this year. Improving upon play in the AAC has to be a priority after going 0-12 in football and being eliminated in the first round of the conference tournament in both men’s and women’s basketball last season. Ultimately, the decision to join the Big 12 is not up to UCF, it’s up to the Big 12. Even if UCF doesn’t make the transition to the Big 12 and remains in the AAC, the future is looking bright for UCF Athletics.